I suggest you get over there. It’s quite long, and it gets a bit difficult to follow without slides around 30 minutes into part 2, but it’s well worth watching. SPJ is an entertaining presenter, partly at least because he seems to be a bit of a stereotypical university lecturer type: very enthusiastic, clearly a towering intellect in the FP world, but on the other hand seems to bumble his way through the business of actually using computers! If he’d been my lecturer back in the day, perhaps I’d have appreciated functional programming a bit more (“To do that, you’d have to solve the halting problem… so… it’s tricky.”). Which pattern is more efficient? Is the Haskell compiler/interpreter able to make pattern b as efficient as pattern a? What about in the more general case where the operation is operating on more than 2 list elements? e.g. Folding a dot product over a list of points (obviously taking three points at a time to compute the dot product of the two vectors formed). In this case, Pattern b would have to perform 2 list appends (is ++ [head is] ++ [head (tail is)]). Would these get optimised? Having read a bit of the next chapter and discovered the zipWith function, I now have a higher-order non-recursive solution to the makeChange problem, viz. i.e. 19 nickels and 4 pennies equals 99 cents. To make life easier, you may assume that the list of denominations is in descending order, and that the penny is always included. However, the problem is at the end of a chapter about using higher order functions like map, foldl, foldr, zip, etc. I have a feeling there’s a way to do this problem that way too. But it’s late and Mrs Elbeno is calling me to bed. AOAP. 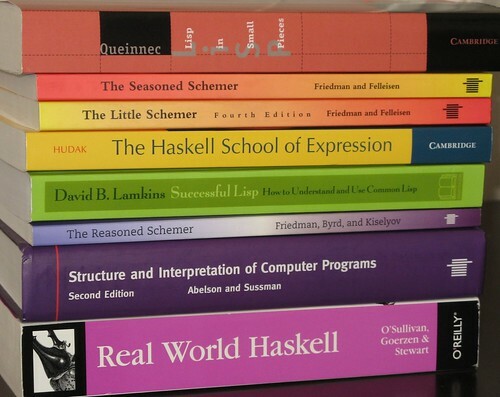 Well, this weekend I dived in with Haskell and started to make my way through The Haskell School of Expression. So I’ve been exercising neural pathways that haven’t seen a treadmill in a while, C++ programmer that I am. Overall, it’s been going well, and it’s giving me the feeling that Haskell is a very nice language. Also, Haskell mode for emacs is just fine. However, there are a few areas where Haskell seems rough around the edges. First, the Haskell Graphics Library doesn’t compile for me – no x86_64 target exists! So I had to switch from GHC to Hugs, which had it built in. I still harbour hopes of a native-compiled HGL, but when I become an experienced Haskell programmer, I foresee a future of library and FFI pain. Second, although I’m generally not too bothered with the Haskell way of indentation being vital to syntax, I have hit a problem that seems to be very common (even bothering experienced Haskellers). And to boot, Hugs’ error message is obscure (“unexpected ;”? I don’t even have any ;’s!). Anyway, I’m up to the stage of drawing snowflake fractals and Sierpinski triangles/gaskets.